March is winding down, and you know what that means. Everyone is turning to their brackets to see how they’re faring as we draw closer to the championship. 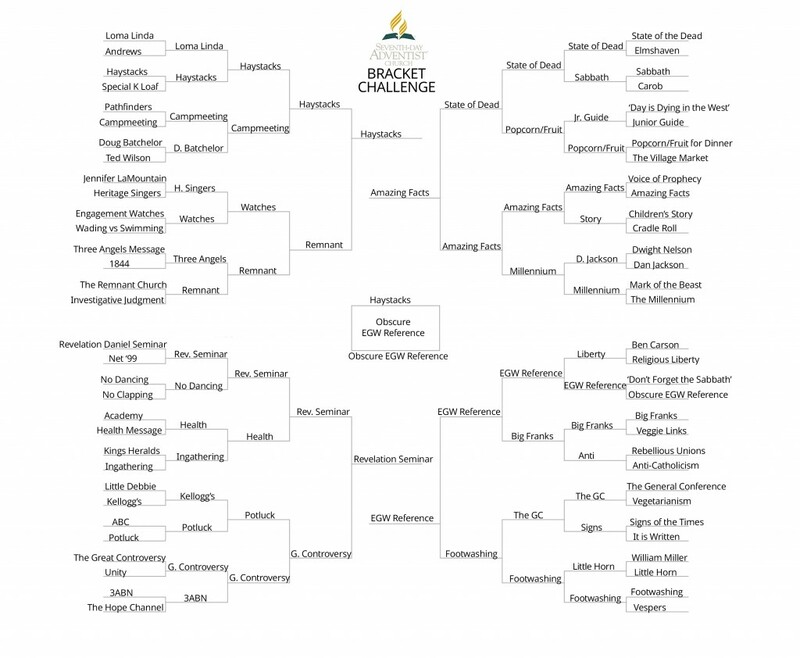 Of course, I’m talking about the Seventh-day Adventist Church’s Bracket Challenge where we see which one word, phrase, action, or piece of theology is the most Adventist of them all. This year’s competition was tight. But winning out, over every other Adventist thing you can image was a person’s ability to throw out an obscure Ellen G. White reference. Can you quote line two of paragraph three on page 32 of “The Desire of Ages?” Or do you know line one of paragraph five of “The Great Controversy?” Then you are among the most Adventist of all the Adventists. Congratulations. Special thanks goes to Misty D. Watson (a proud Badventist) for the guest post! You forgot “Guarding the edges of the Sabbath”, “WO”, “SDA Liberals”, SDA Conservatives”, “The Sanctuary”. There is always next year. I still root for Little Debbies!